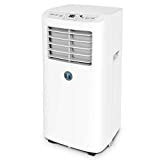 JHS - A019-8KR/A: Portable Air Conditioner Review • The Air Geeks, reviews of air conditioners, dehumidifiers and air purifiers. The JHS A019-8KR/A portable air conditioner is a suitable cooling solution for small spaces. With a cooling capacity of 8,000 BTU, this unit is suitable for spaces that are up to 170 square feet. This unit can be used for cooling, dehumidifying, or circulating the air in your room. It is also equipped with an adjustable digital thermostat that helps you to control the heat conditions of your room. In case you are interested in the JHS A019-8KR/A portable air conditioner, then you are most probably looking for information about its features and performance. Here, we have gathered all the information about this unit to help you to know more about it and make a well-informed final decision. The JHS A019-8KR/A is a powerful air conditioner that offers a cooling capacity of 8,000 BTU. It is ideal for small rooms and the manufacturer recommends it for spaces that are up to 170 square feet. You can use this portable unit in your bedroom, kitchen, garage, or office. 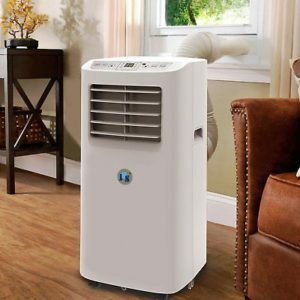 Are you looking for a portable air conditioner that features a dehumidifier? This air conditioner features an in-built dehumidifier that extracts excess moisture to ensure that the air in your room has acceptable moisture content. Hot and humid air encourages growth of harmful mold and mildew, and it is important to ensure that your room is free from excess moisture. The unit can remove up to 31.7 pints of moisture per day. In case you are looking for a unit that does not demand daily user attention, then you should consider the JHS A019-8KR/A portable air conditioner. This unit has a self-evaporation system to save you the hassle of draining the water every now and then. In addition, it has an electrostatic filter that purifies air to ensure that it is clean and fresh. If you are looking for an easy to use portable air conditioner, then the JHS A019-8KR/A portable air conditioner is designed for you. The intuitive user interface of this unit allows you to adjust the environment of your room with ease. Moreover, this unit comes with a remote control and offers a 24-hour programmable timer. Although most air conditioners are heavy, this portable unit is relatively light and weighs 44lbs only. This makes it easy to carry. It addition, it is equipped with strong castor wheels and a handle to allow you move it easily from one part of your house to another. Moreover, this unit is cheaper than most portable air conditioners of same capacity. Are you looking for a quiet air conditioner for your bedroom? If your answer is yes, then you may need to consider another model. We have established that this unit produces sound that can be disturbing to people who are highly sensitive to noise. Easy to use. The digital display and the remote control allow you to adjust the settings of your system from the comfort of your couch. You can save energy by setting the unit to sleep mode when the room attains your preferred temperature. Easy mobility. This air conditioner is light and can be moved easily from one part of the house to another. The strong castor wheels and the steady handle make it easy for you to move the unit. 3-in-1 design: This unit is designed to perform three functions and features a cooling system, a dehumidifier, and a fan to circulate the air in your room. This saves you money since you do not need to buy separate appliances for the three functions. It produces a loud sound. We have observed that this air conditioner produces sound that can be disturbing to people who are highly sensitive to noise. This characteristic makes it an unsuitable choice for quiet spaces. In areas that are extremely hot, this unit is less effective. Although this unit is effective in cooling spaces, we have observed that it can be less effective when used in areas with high temperatures. I ordered this air conditioner two weeks ago and arrived in two days. It was ver well packed with no damage to the body at all. It came with screws and boards to help the pipe stays on the window. The package was very heavy but the actual unit is weight reasonably and was really easy to assemble, basically it is plug and play. Only took me two minutes to set up and settle the pipe. For noise part I think it is alright, definitely not as quit as central ac but can be handled in the day time, probably around 50db. For my regular size bedroom, the ac get it cooled in about five minutes and can actually make the room really cold if you set the temperature lower. For the two hundredish price, I think it met my expectations." I bought this unit last week and it arrived quickly. The sleek unit looks very good and it's very easy to set it up. I tried it for a few days and it works great. The local weather is mild right now and I haven't had a chance to test it in very hot weather yet, but cold wind from the unit is strong. One concern I had was the noise, this unit is surprisingly quiet. I used an Android App to measure the noise level. The noise is between 52dB and 55dB when I stay about one yard away, and the App shows the noise is "conversation" level." The JHS A019-8KR/A portable air conditioner is a suitable cooling unit for small spaces that are up to 170 square feet. The 3-in-1 design of this portable unit makes it a suitable solution for cooling, dehumidifying, and circulating air in your room. Moreover, this unit is light and can be moved easily from one room to another. However, we have observed that this unit is less effective when used in areas that are extremely hot. The unit also produces loud sound, and it is therefore unsuitable for quiet spaces such as bed rooms, study rooms, and so on. There you have the details. Make a well informed choice!